A newfound appreciation for her hometown inspired a line of jewelry from an already-experienced designer. Like lots of girls growing up in the 1980s and ’90s, Mandi Wirtanen started making jewelry as a kid—friendship bracelets at age 5 and beaded, fringe-style earrings after that. But what initially served as a fun hobby blossomed into a serious interest; by age 10, Wirtanen had already made her first visit to the renowned Tucson, Arizona, Gem and Mineral Show; two years later, in 1992, she and her mom opened jewelry-making and supply shop A World of Beads in a back room at Springdale’s Supreme Golf (Wirtanen’s father’s business). 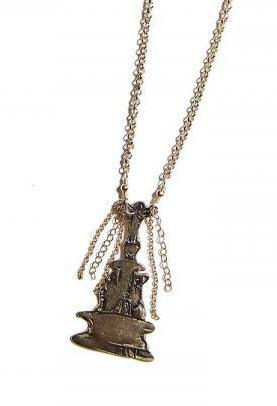 The thing that really “got our name on the map,” she says, was a line of lariat-style necklaces. “They were flying out of here,” Wirtanen says of the lariats, which the then-13-year-old fashioned after a piece Jenny Garth wore on Beverly Hills 90210. “I’m coming home after school making these necklaces. We had to hire customers to work for us” just to keep up with demand. She and her mother relocated A World of Beads to Hyde Park Square in 2002. By 2007, Wirtanen knew she needed to both stretch her wings and learn more about the craft, so she left the shop in her mom’s hands and headed to California. There, she earned a degree in Applied Jewelry Arts from the Gemological Institute of America and became a certified Gemologist. When she returned home in 2009, she saw Cincinnati—and its iconic buildings—with fresh eyes (touring her now-husband, a Michigan native, around the city certainly helped). 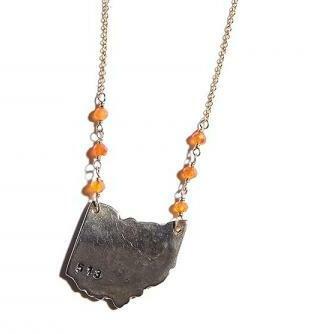 “It took a few years,” she says, but that newfound love for her hometown morphed into a line of handmade jewelry based on iconic local structures, including Union Terminal, the Tyler Davidson Fountain, and Music Hall. 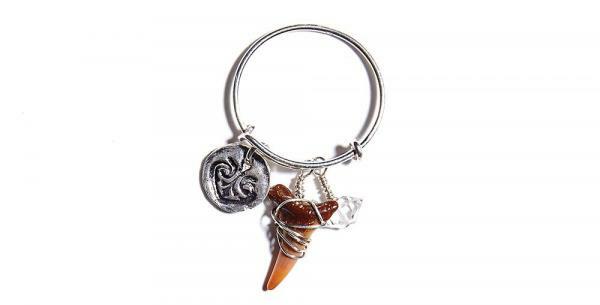 Wirtanen’s current line, Mandalynn Designs, is an eclectic mix of necklaces, earrings, bracelets, and rings made with materials ranging from bronze to gemstones and even reclaimed items like skeleton keys; she also does a lot of custom-order work. She sells her wares in-store, online, at City Flea, and—most recently—in Gallery 708 downtown. The shop will always sell beads and teach jewelry-making classes, says Wirtanen, but next up on Mandalynn Designs’ to-do list is creating pieces based on the Great American building and “possibly” on more local windows—though she’s not yet saying which ones. Just one more reason we’ll have to keep visiting A World of Beads. 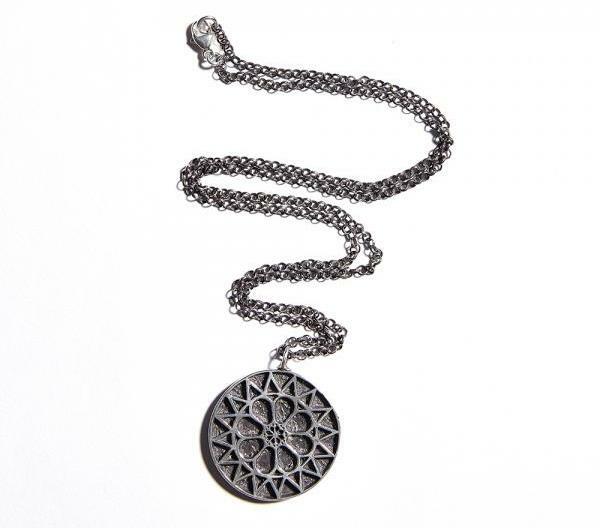 Just debuted in October: hand-made pieces featuring replicas of Music Hall’s Rose window. Wirtanen’s charm-style rings feature baubles like miniature shark’s teeth and precious gems.